Super handy to carry around, this mat is perfect for small projects and English paper piecing. Self healing, markings in inches on one side, blank on the other. Both sides are usable. Perfect size for small blocks and particularly English Paper piecing. Self healing and with a foam back to stop it from slipping. These are mini rotary cutters that fit in the palm of your hand. They securely close on themselves when not in use. Perfect to keep near your sewing machine for cutting threads and little bits of fabrics (those little dog's ears that you get on half square triangles for instance). Great travel size to keep with your English paper piecing kit! The blade is not replaceable. We are not allowed to sell this item to under 16s. 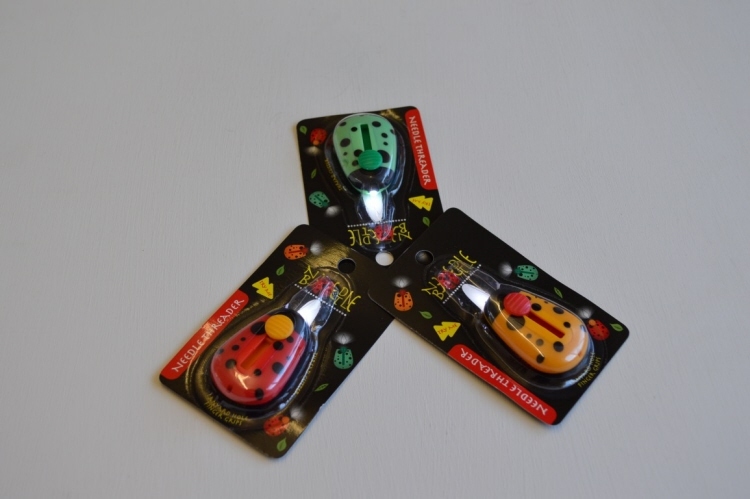 This beetle threader is a must have in your sewing basket! It comes with an integrated light. You get the choice of colours. Perfect Christmas stocking fillers for your sewing friends. If you do a lot of fussy cutting for your English Paper Piecing then this is a must have tool!! It allows you to audition your fabrics before cutting, saving you time and money! It is amazing what wonderful patterns you will discover among your existing stash!! It comes with full instructions and hints and tips. Click on the little magnifying glass in the photo to see it in action! This conditioner strenghtens thread for long life, prevents tangling and fraying, does not melt, safe for all threads and fabrics. Acid free. Works for hand sewing and machine sewing. Comes with instructions. If you are familiar with paper piecing, you have probably come across Sue Daley. She is the Australian Queen of paper piecing and have come up with some new and fast methods for English paper piecing. The Duke Road quilt is my favourite of hers!! We have a limited stock so if you are tempted, don't leave it too late! A very detailed booklet containing all instructions on how to paperpiece and how to make the whole quilt. Not included: fabric and spare time. Precut paper shapes for paper piece quilting. Finished size approximately 4" each. Finished size approximately 3" - 4". Include fabric, ribbon and precut paper shapes for paper piece quilting. Finished size approximately 3" each. Finished size approximately 19" x 23"
Pattern includes Paper Pieces Pre cut Papers Dresdens, Diamonds, Hexagons, Triangles, Hearts and Half Hexagons.